Does Play Sand Cause Cancer? Last summer I purchased a used rigid plastic sand box with a cover on Craig's List. Once I had the sandbox, all I had to do was buy some sand. Unfortunately, this decision was not as simple as I had hoped. If you live in California, you've possibly seen the Prop 65 cancer warning on bags of play sand. That's because the super cheap fifty pound bag of sand you can pick up at home improvement stores or garden centers isn't actually sand. 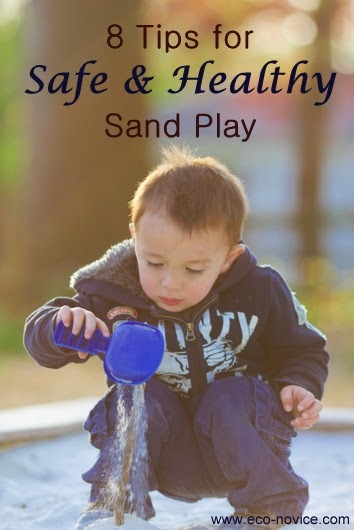 According to Healthy Child Healthy World, "'Play sand' is a manufactured material made from ground quartz that can contain carcinogenic crystalline silica and a mineral called tremolite, which is related to asbestos." You can read more about the classification of crystalline silica as a human lung carcinogen in this OSHA document. Some emphasize that the risk is mainly an occupational hazard for sand blasters who experience intense and prolonged exposure to the crystalline silica dust. While children certainly aren't subject to the same degree of exposure as sand blasters, parents still may not be comfortable with their children inhaling respiratory irritants linked to cancer. The issue isn't the silica, which is present in all sand, but the size of the particles. Finer particles can be inhaled into the lungs, causing respiratory irritation and an increased risk of mutations and tumors. So if you see a dust cloud above the sand box, you have an issue. After learning about the risks associated with manufactured "play sand," I decided to invest in Sandtastik sand, which contains no crystalline silica or quartz. I was familiar with this sand because it is used by my local children's discovery museum (and many day care centers). The fact that it produces so little dust makes it safe for indoor use. You can purchase Sandtastik sand on Amazon or some teaching supply stores (I bought mine with a buy-one-get-one-half-off coupon from Lakeshore). But here's the thing. This non-toxic sand is so expensive that I have trouble letting my children play with it. I wince over every tablespoon that exits the sand box. Safe Sand is another safer sand option, but also expensive, particularly with shipping costs (which you don't have to pay if you can pick up locally in San Francisco). I've read you can find bags of river or beach sand through landscaping companies and garden centers, and that may be a less expensive option that I will look into in the future (my initial phone calls a year ago did not product results). I'd love to know if this option has worked for you! So there's the sandbox dilemma: Crushed rock with a potential cancer hazard that costs about 50 pounds for 5 bucks versus $1-per-pound non-toxic sand that you can barely stand to watch your kids play with. Note that most sandboxes recommend 200 or more pounds of sand to fill them. Based on my experience, here are some options for those seeking non-toxic backyard sand play. 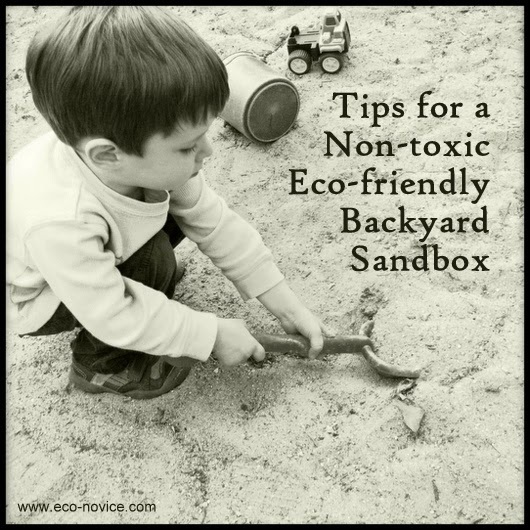 Fill your sandbox with non-toxic sand. If you are purchasing 100 to 200 pounds of sand to fill an average-sized sandbox, this will cost you $100 to $200 or more. Given all the creativity and beneficial development that can result from sand play (plus it gets your kids outside! ), consider this a reasonable investment. If, however, your blood pressure will rise every time a teaspoonful of your $1-per-pound sand leaves the sandbox, consider other options. Or perhaps your children are more obedient, tidy, and trainable than mine, in which case this may not be such a big issue! Fill your sandbox with the cheaper sand, but choose a grittier (less fine) size that has been washed to reduce dust. SafeMama recommends Sankrete's "Natural Play Sand," although from the MSDS I can see that it does contain crystalline silica (she says it's very low dust). Try to keep the sand a little moist to reduce the risk of inhalation, particularly on hot dry summer afternoons. On the other hand, moisture promotes bacterial growth, so make sure to let the sand dry out completely in the sun regularly when it is not being played with (and then cover it up before night time to keep critters out). If watching your kids play in/ inhale/ eat this sand will give you an anxiety attack, consider other options. Skip the sandbox and instead use a sand table (or re-purposed water table) or a small container for sand play. Since you will need less sand, you can afford to fill it with the non-toxic sand. Unfortunately, it may be even more difficult to keep your pricey sand inside a sand table or container than inside a sand box. And here are some tips for safe sand play wherever you may be: backyard, public park, beach, etc. If your sand is very dusty, consider switching to other sand or keeping sand a little moist while children are playing in it. An extremely dusty sand box is cause for concern because it poses an inhalation hazard and respiratory irritant for small children playing in it. Purchase a used sandbox or sand table on Craig's List if possible. Click here for tips on how to successfully and safely purchase used items on Craig's List. If purchasing a wood sandbox or making your own wood sandbox, be sure the wood is not pressure-treated wood. Cedar and redwood are good choices that don't require pesticide treatment for outside use. Any stains or paints used should be non-toxic and low-VOC. Use a cover with your sandbox to keep animals from using your sandbox as a litter box. Also to keep stinging insects out. However, avoid flexible covers made of PVC. I've never seen a plastic sandbox made of PVC, but sometimes the covers are vinyl. If your sandbox doesn't come with a cover, make a tight-fitting one (out of a nylon tarp perhaps). To prevent bacterial growth, allow sand to dry out completely on a regular basis (particularly important if you have a plastic sandbox with a bottom that does not allow for any drainage). Regularly washing sand can also help remove bugs and bacteria. Provide adequate sun protection. If you cannot put your sand area in a shaded area, create shade with umbrellas or canopies, cover up with hats and long sleeves/ pants, and use non-toxic broad spectrum sunscreen. Minimize children's ingestion of sand by keeping eating and sand play separate. Have children wash hands thoroughly after playing in the sand. Choose eco-friendly sand toys. Green Toys makes toys from recycled milk jugs. Sprig sand toys are made of a bio-composite material made from recycled wood and reclaimed plastic. German company Haba Spielstabil makes quality durable plastic sand toys free of PVC, BPA, and phthalates. Zoe B Organic sand toys are made using biodegradable corn-derived plastics. You can also purchase kid-sized garden tools made of wood and metal for sand play, or simply purchase wood and metal gardening tools from a local store. Keeping toys out of the sun when not in use will prolong their use. Many common household items (such as funnels and empty yogurt containers and other plastic food containers of all sizes) also make fun sand accessories. I do let my kids play in park sandboxes, even though I know they are the dusty fake sand and contain higher amounts of bacteria (from both wildlife and leaky diapers). Outside time and playing with friends trump my concerns. But I'm not quite so sanguine about hosting a potentially toxic litter box in my own backyard. When playing in public sandboxes, I do try to keep eating and sand play separate and wash their hands well before eating. Do you have a backyard sandbox? Tell us about it! This is an amazing post. I never knew that play sand could be toxic. Sharing. Hi I just wanted to add in email the manufacturers and ask for ingredients and proof of ingredients. I recently found out some companies can get away with using asbestos to dye it white. Other companies like Este's art sand uses toxic paint to dye their sand different colors!!! And some of this junk comes from China. Sandtastik uses feldspar family rocks, which they claim are non-carcenogenic. However feldspar rocks can contain aluminium which is already know as a dangerous substance if prolonged exposure to the skin, absorbed through the skin or ingested. So always ask for proof from the manufacturers. Feldspar may be less likely to cause cancer than silica or quartz but many minerals can be harmful over time. It talks about feldspar. It can hurt lungs over time if too dusty so that can get dangerous. However I guess the carcinogenic factor is low to not at all. Wonderful information! Thank you for sharing the results of your research, Touya.